Mountain Brook has something to please every palate. A progressive or traveling dinner—with stops at two or three or even four places—lets you discover lots to love. There’s no better time to do this than right now, in the middle of Mountain Brook’s Restaurant Trail Challenge. Here’s how to hit this trail: Enjoy a snack, meal, dessert, drinks, coffee, limeade or whatever at one of Mountain Brook’s participating eateries (there are 49 and counting!) from now until December 1. Each time you do, document your visit by posting a photo to #i8mb on Instagram or Facebook. When you complete the trail by visiting all the restaurants, let the city’s Chamber of Commerce know. Just email chamber@mtnbrook.org, and you’ll be entered into a really cool drawing for a grand prize (worth more than $1,800) that includes a night’s stay and a Cooking School experience at the Grand Bohemian Hotel; $100 in Village Gold to spend at each of these restaurants: Root to Tail, Newk’s Eatery, CharBar No. 7, La Paz, Vino, Billy’s and Dram; $75 at the new Icehouse, $50 at Zoe’s and at Local Taco; goodies from Black Sheep Kitchen; an ice cream cake from Mountain Brook Creamery, and more. The Mountain Brook Restaurant Trail includes eateries all over the city, but for the purpose of our traveling dinners, we’ll focus on the three oldest villages: Mountain Brook, English and Crestline. Before we take one more step, know that most of Mountain Brook’s locally owned restaurants follow seasonal menus for both food and drink. You might not find these exact dishes and cocktails on the menus, but you’re sure to discover something similarly delicious. Also, logistically, it makes sense to make reservations where you can to keep your evening moving along nicely. You could travel between the villages for your customized meal, but we’ll offer options within each village to get you started. Begin your jaunt at the Grand Bohemian Hotel’s sophisticated rooftop bar with a handcrafted cocktail. Over the Mountain takes on a whole new meaning with Bulleit bourbon, Cardamaro, simple syrup, Fernet-Branca and Jack Rudy Aromatic Bitters. The Meeting Street Mule is Bombay Sapphire East gin, lime, a ginger shrub and ginger beer. Happy hour here is 3 to 6:30 p.m. Monday through Friday. Every Tuesday in the summer, from 6 to 9 p.m., enjoy Rosé on the Rooftop. And there’s a wine machine here, too—just swipe your card to get a taste or a glass. Take some time to walk around the hotel’s art gallery with its carefully curated collection of paintings, sculpture and jewelry. Next, walk over to Dram for an appetizer of pimento cheese and baked lavash crackers. After that, head to dg, Daniel Briggs’s lovely restaurant in the heart of Mountain Brook Village, for a white-tablecloth dinner of pan-seared Gulf-fresh fish with crawfish risotto, spinach and red pepper beurre blanc or roasted Colorado lamb chops with couscous, Brussels sprouts and chili cocoa jus. (A shout-out to dg for one of the best meat-and-three lunches in this town, or anywhere really. Love those cornmeal-crusted oysters!) End your dinner with either ice cream at the delightfully old-fashioned Mountain Brook Creamery, or walk back over to Lane Parke for a latte at the ultra hip Revelator Coffee Company. Jim Davenport’s Pizza Palace (one of Mountain Brook’s oldest businesses) and the “local tacos” at Local Taco (try the Alabama White with smoked chicken, coleslaw and Alabama white sauce). Gulf shrimp and grits. Finally, find your dessert right up the street at Chez Lulu. The Belgian chocolate almond tortelette (a chocolate flourless cake with chocolate ganache) is a chocolate-lovers dream. But so is the pot de crème made with dark Belgian chocolate and Octane espresso. And you cannot go wrong with the crème brulee (perfectly crisp crust!) and fresh berries. Owner Carole Griffin has been making artisanal breads and other baked goods in the French tradition for more than three decades. She expanded her business to this European-style café with sidewalk seating in 1994. Vino and Billy’s is always good for a great burger and a pint of local beer. Not to mention a take-home bottle of white sauce. Chris and Anna Newsome relocated their restaurant, Ollie Irene, to Crestline Village last year, and they see lines out the door most nights. Begin with craft cocktails here. The Boss-Eyes is a lovely mix of vodka, crème de violette, lime and ginger beer. Knees Up is gin with Cappelletti, lemon and honey, and the Blind Cobbler’s Thumb is rye, Campari, Cocchi Vermouth di Torino, Luxardo maraschino, Angostura bitters and Pernod. 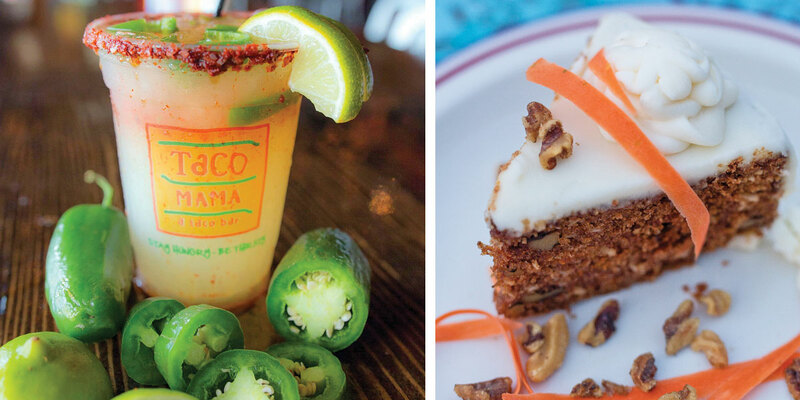 If margaritas are more your style, Taco Mama, right up the street, has lots of options. Seasonal versions feature watermelon or blood orange. There’s a low carb “skinny” ‘rita and a spicy jalapeno one, but you just can’t go wrong with the classic Mi Casa. 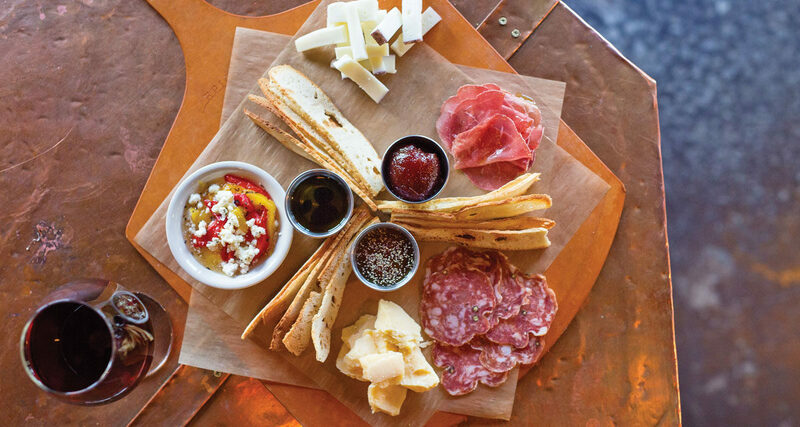 Next, walk across Dexter to an awesome charcuterie board and cheese plate at MAFIAoZA’s. They call it “piccolo morsi,” which translates to “a few bites.” Choose from meats that might include salame Toscano with black pepper and Spanish chorizo and cheeses like Drunken Goat and Rogue River Smokey Bleu, and you can just call it delicious. Then head over to Dyron’s Low Country for a delicious dish of shrimp and grits or Tanglewood Farm buttermilk-fried chicken. 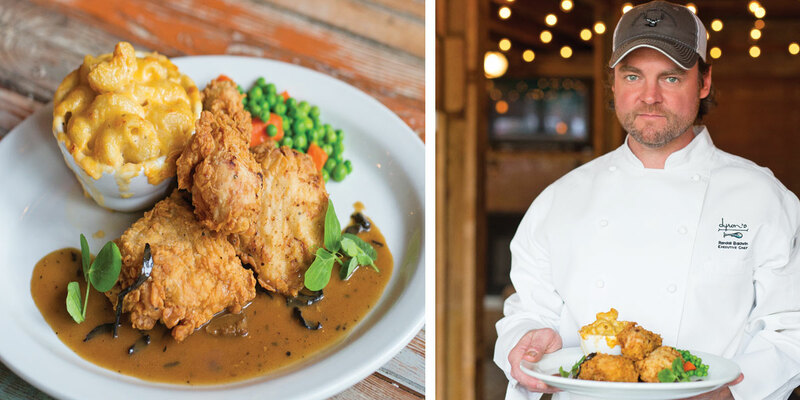 Executive chef Randall Baldwin’s fried chicken is regionally (and maybe even nationally) famous. One celebrated, local, James Beard Award-winning chef paired this fried chicken with Champagne at his own daughter’s wedding rehearsal dinner recently. Finally, walk over to Church Street Coffee and Books and enjoy a cult-favorite Breakup Cookie. These cookies, with big chunks of chocolate and a little sea salt sprinkled on top, are on a list of “55 Things You Must Eat in Birmingham,” and Insider named this the best cookie in Alabama. Other Crestline Village favorites to mix and match: the burger (and live music Thursday through Saturday) at Otey’s Tavern, Mama’s Chorizo taco basket with queso as a side dish at Taco Mama, masaman chicken or any of the sushi rolls at Surin of Thailand, Mexican street corn and/or the shrimp quesadilla on a jalapeno tortilla at La Paz and the create-your-own sweet treats at 32 Degrees yogurt bar.